A 5-minute walk from the Kurfürstendamm shopping street, this hotel offers rooms with free Wi-Fi and hot drinks facilities. 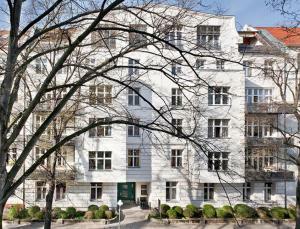 It stands in a quiet side street in Berlin’s Wilmersdorf district. Hotel Garni Kleist am Kurfürstendamm is located in a traditional Berlin building. Its spacious rooms feature high ceilings and large windows. A varied breakfast buffet is provided each morning. A 10-minute walk takes you to the bars and restaurants of Savignyplatz. S-Bahn trains run directly to the Berlin International Congress Center from here. Olivaer Platz is a 5-minute walk away, and offers direct bus connections to Zoologischer Garten and Tegel Airport. Hotel Garni Kleist is also just 50 metres from the TU Berlin (Berlin Institute of Technology).